Sheet 1 of the 1855 map series. Source: WIG Map Archive. In 1855, Rohatyn was part of the Austrian Empire’s crownland of Galicia, and it had been a recognized city with self-governing rights for more than 300 years. Although no railroads yet traversed the region, Rohatyn was an important crossroads settlement for north-south (Lemberg to Bursztyn and Stanisławów) and east-west (Chodorów to Brzeżany) travel and trade routes. 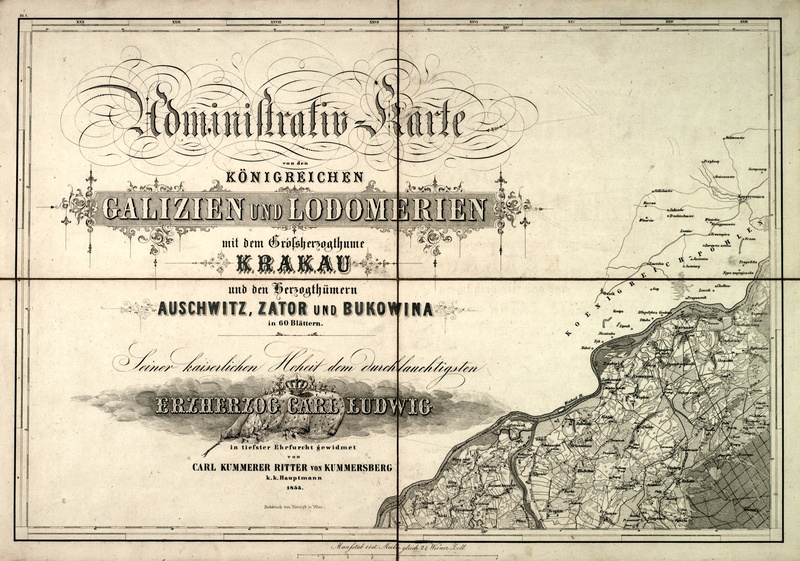 The Rohatyn region was documented as part of an 1855 series of maps with the very long title Administrativ Karte von den Königreichen Galizien und Lodomerien mit den Grossherzogthume Krakau und den Herzogthümern Auschwitz, Zator und Bukowina, designed in 60 sheets at 1:115,000 scale by Carl Kummerer Ritter von Kummersberg (1797~1877), an official in the Empire’s cadastral map survey operations in Moravia, and published by Verlag und Eigenthum von Artatia in Vienna.The title sheet is a spectacular example of the flamboyant lithography of the period, but the individual map sheets are no less remarkable for their accuracy and detail. Rohatyn appears on sheet 32, along with the nearby towns of Bóbrka, Chodorów, and Przemyślany. For a study of the 1855 geography of the Rohatyn district for the Rohatyn Shtetl Research Group, we created a digital composite of portions of four sheets, including sheet 32, sheet 33 (with Brzeżany), sheet 39 (with Bursztyn and Halicz), and sheet 40 (with Podhajce, just off the map). That district composite is the image presented here in an overlay on Bing Maps satellite data from the contemporary town. The image is interactive: pan and zoom are available with ordinary mouse controls or gestures, depending on the device, and zoom is also available by the +/- buttons in the upper left of the display. The map can be made transparent in 10 steps by sliding the control in the upper right of the image. This 1855 regional map is one of a series of historical map overlays included in the project Mapping Rohatyn: Geography as an Education Resource.